In a deep oven safe sauté pan over medium-high heat, warm the oil and butter until shimmering. Season the chicken generously with salt and pepper and sprinkle the oregano, thyme and rosemary evenly over the pieces. Arrange the chicken in the pan and cook, turning once, until golden, 2 minutes per side. Transfer the chicken pieces to a platter as they are browned. Reduce the heat to medium-low and add the garlic and the lemon zest to the pan. Sauté, stirring often, until the garlic is tender and fragrant, 1 to 2 minutes. Stir in the lemon juice to deglaze the pan add ½ cup of the chicken broth, return the chicken to the pan and transfer to the oven uncovered. 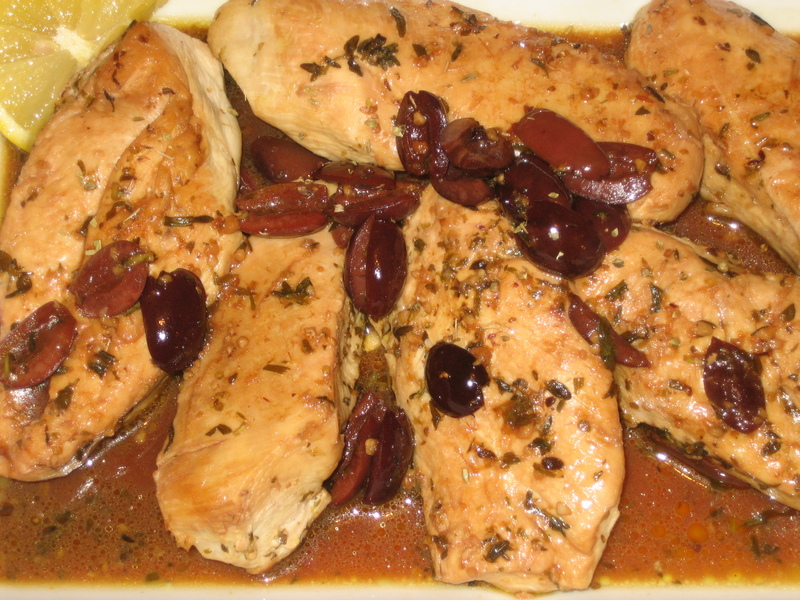 Roast the chicken for 10 minutes and coat the chicken with the pan juices and add the olives. Continue roasting for another 15- to 20 minutes When the chicken is done and temp reaches 165 degrees, transfer the pieces to a warmed platter and set the pan over medium heat. Add the remaining ½ cup of chicken broth and bring to a simmer, stirring to scrape up any browned bits. Cook until the juices are reduced by half, 3 to 4 minutes. Adjust seasonings with salt and pepper. Pour juices over chicken, garnish with lemon wedges and serve immediately.